Westerbork concentration camp (Dutch: Kamp Westerbork, German: Durchgangslager Westerbork) was a World War II Nazi refugee, detention and transit camp in Hooghalen, ten kilometres north of Westerbork, in the northeastern Netherlands. Its function during the Second World War was to assemble Roma and Dutch Jews for transport to other Nazi concentration camps. On 15 December 1938, the Dutch government closed its border to refugees. From then on, any refugees would not have any rights. In 1939, the Dutch government erected a refugee camp,Centraal Vluchtelingenkamp Westerbork, financed, ironically, partly by Dutch Jewry, in order to absorb fleeing Jews from Nazi Germany. The Jewish refugees were housed after they had tried in vain to escape Nazi terror in their homeland. 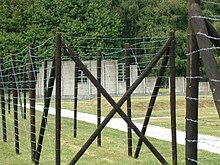 During World War II, the Nazis took over the camp and turned it into a deportation camp. From this camp, 101,000 Dutch Jews and about 5,000 German Jews were deported to their deaths in Occupied Poland. In addition, there were about 400 Gypsies in the camp and, at the very end of the War, some 400 women from theresistance movement. In 1950, the Dutch government appointed the Jewish historian Jacques Presser to investigate the events connected with the massive deportation of Dutch Jewry and the extent of the collaboration by the Dutch non-Jewish population. The results were published fifteen years later in The Catastrophe ("De Ondergang"), a book which shocked the reading public and had a profound and lasting effect on the Dutch perception of the war years. Presser also published a novel (The Night of the Girondins) set in Westerbork camp itself. The hero is a Jewish prisoner, who is appointed an officer and has the problematic role of helping the Nazis transporting his "brothers" to their obvious deaths in Occupied Poland. Between July 1942 and September 1944, almost every Tuesday a cargo train left for the concentration camps Auschwitz-Birkenau (65 train-loads containing 60,330 people most of whom were gassed on arrival), Sobibór (19 train-loads of 34,313 people, all of whom were killed on arrival), Bergen-Belsen and Theresienstadt (9 train-loads of 4,894 people some 2,000 of whom survived the war). In the period from 1942 to 1945, a total of 107,000 people passed through the camp on a total of 93 outgoing trains. Only 5,200 of them survived, most of them in Theresienstadt or Bergen-Belsen, or were liberated at Westerbork. Parts of a rebuilt hut at Westerbork. Anne Frank stayed in the hut shown to the left from August until early September 1944, when she was taken to Auschwitz. She and her family were put on the first of the three final trains (the three final transports were most probably a reaction to the Allies' offensive) on 3 September 1944 for Auschwitz, arriving there three days later. Etty Hillesum stayed in this camp from 30 July 1942 until 7 September 1943, when she and her family were put on a train to Auschwitz. The German film actress and cabaret singer Dora Gerson was interned at Westerbork with her family before being transferred to Auschwitz. The Canadian 2nd Infantry Division liberated the several hundred inhabitants that were still at Westerbork on 12 April 1945. The first soldiers to reach the camp were from the Reconnaissance Regiment, followed by troops of the South Saskatchewan Regiment. Following its use in World War II, the Westerbork camp was first used as a penalty camp for alleged and accused Nazi collaborators and later housed Dutch nationals who fled the former Dutch East Indies (Indonesia). Between 1950 and 1970 the camp was renamed to Kamp Schattenberg and used to house refugees from theMaluku Islands. Monument at Westerbork: Each single stone represents a single person that had stayed at Westerbork and died in a Nazi camp. In the 1970s the camp was demolished. Near the site there is now a museum, and monuments of remembrance of those transported and killed during World War II. The camp is freely accessible. The Westerbork Synthesis Radio Telescope (WSRT) was partially constructed on the site of the camp in 1969. 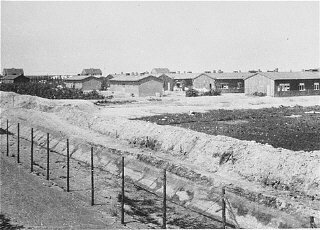 A view of the Westerbork camp, the Netherlands, between 1940 and 1945. 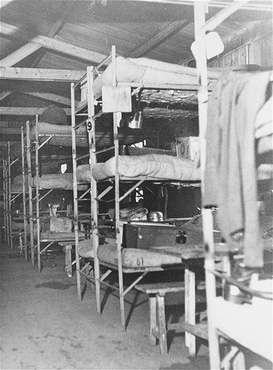 The interior of a barracks at the Westerbork transit camp, after liberation. Westerbork, the Netherlands, after April 12, 1945. 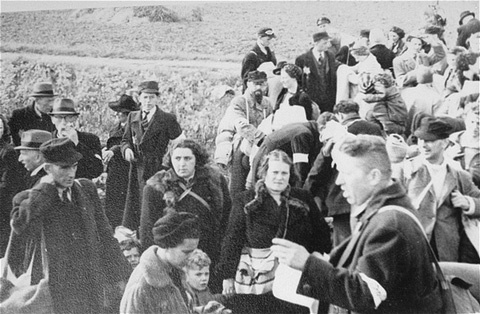 Arrival of Jews at the Westerbork transit camp. The Netherlands, 1942.